Coming off a record 2.13 GW of new installations in June (just prior to the announced FIT decrease), the latest data from the Bundesnetzagentur (German Federal Network Agency), shows that Germany's solar industry added another 1,060 MW during July and August. This brings the total for the eight-month period from January through August up to 4.88 GW. This is 300 percent higher than the same period last year - and more than the 3.8 GW of solar installations in Germany in 2009. Germany currently accounts for approximately half of all photovoltaic (PV) systems installed worldwide in 2010. Seemingly determined to put an end to speculation that solar photovoltaics (PV) can't "scale" quickly enough to make a dent in electricity consumption, the German solar industry continues to break records. The following graph, shows a breakdown of the 175,000 solar energy systems registered with the Bundesnetzagentur website through the end of August 2010. German Solar PV installations to date are capable of generating slightly less than 5 TWh of electricity under German conditions. Germany consumed 580 TWh of electricity in 2009. Therefore, solar PV installations through the first eight months of 2010 are capable of providing 0.86% or nearly 1% of the country's electricity. At the current pace of development, Germany will add about 6,000 MW of PV for all of 2010 or more than enough to provide 1% of electricity supply. Germany currently meets approximately 1% of its supply with solar PV. With the 2010 additions, the country will meet 2% of its supply with solar PV. Critics of solar energy have often charged that solar could not be scaled or installed quickly enough to have a significant effect on electricity supply. It is now clear that solar PV can indeed scale where the policies are designed to do so. 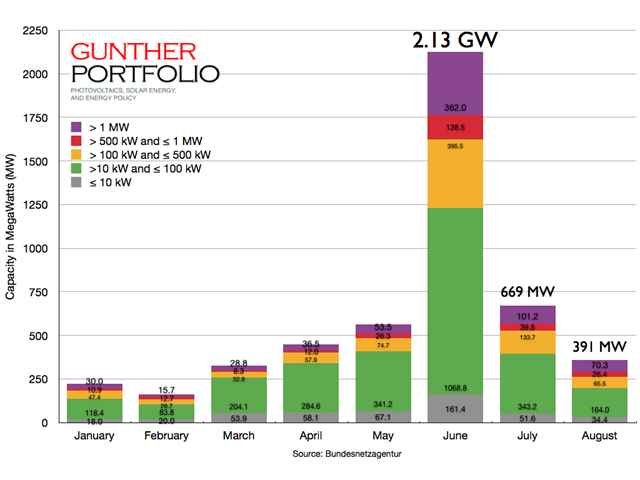 Recent estimates predict that installations in Germany will approach an unforeseen 9.5 GWp in 2011, according to iSuppli. Italy, which itself is having a super year may overtake Germany as the leading market, with the US, France, Japan and China soon to follow, Wicht said. “We expect numerous countries offering solar incentives which are not yet visible today. Indeed we expect markets to shift, however, Europe will still attract approximately 60 percent of all installations,” according to Wicht. We have more than 700 articles available on this website and our Solar News Blog. To learns more facts and advice about a wide variety of solar related products and issues - use our built-in site searching tool below. Just type in a few key words or phrases to search this site, our blogs, our Facebook fan page and our other sites for related articles and links. Back from Germany 2010 to Home for Solar Energy.